I've started work on an idea for corner brackets to assemble a solid frame for Darwin. 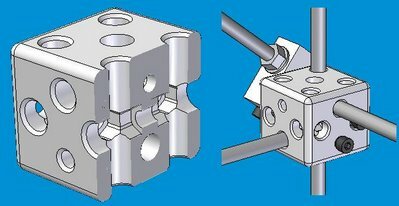 It's 45x45x40mm, symmetrical and provides 'through-hole anchorage' (i.e. the bar passes all the way through the bracket, thus rockhard clamping) for three bars and one bit of studding. Also, if the bolt configuration's right (which is a real mind-job) it also offers 2 expansion holes, 3 without the studding (I think, maybe 4). Front page of the Guardian the other day you guys, nice one. That's a really nice design, Ed. I'm left to wonder, though, what advantage there is to reprapping something like this? It looks to me like an item that somebody with a bar of nylon or of aluminum stock and a hacksaw could knock out with a $100 drill press in a tenth the time and a third of the cost that it would take to make it on a RepRap. Actually, I'm trying to say something positive. That's a really good bootstrap component for a reprap. What you can't see is the subtlety of the internal cavities that allow very versatile clamping. They would be virtually impossible to cut from solid. It only seems easier to use a drill press because you have one and because RepRaps are not cheap and ubiquitous. Once they are, it'll seem much simpler to make it with one mouse click than to mess around with drills and things - and besides, drill presses will be much less common when everyone has a RepRap in their garage. Trying to cut down on support material, and accepting circular rods of both metric and imperial diameters without any modification to the design. Good point. I'll do some research on the standard bar ø's across the globe. I'm sure if we were in the crusades era we'd just get a gang of horses together and charge around with broad swords declaring the world metric. "We are the knights that go SI!" I thought the world was officially all moving to, or already metric, but the US was not. My Ford truck is an amazing mish-mash, many parts are metric, and some bolts have SAE threads with metric heads! Here in Canada, finding metric bar stock is not straight forward. Same with metric drill bits. Due to massive trade with the US. Thanks for the great idea. Definitely using this for a RepStrap. I may even make some Polycaprolactone cubes by hand to speed Repstrapping.